Illegal immigrants are much in the news lately, but immigrants of a different sort are sneaking across our borders and causing havoc. 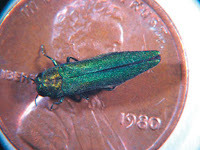 The Emerald Ash Borer, a beetle from Asia discovered here in 2002, has killed countless ash trees – more than 20 million in Michigan, Ohio and Indiana alone. It has cost towns, property owners, nurseries, and forest products industries – even baseball bat makers – tens of millions of dollars. It’s just one of a passel of insect and plant pests that have entered our country hidden in packaging or produce. Some problem plants, such as Purple Loosestrife, Japanese Knotweed and Yellow Flag Iris, were imported deliberately because of their beauty, only to become bulls in an environmental china shop. Without natural controls, some alien plants spread wildly, pushing out native plants and in the process destroying ecologies that support many native birds, fishes, reptiles, amphibians, and insects. What can we do? Know and destroy invasive plants. And insist that legislators support not only better surveillance of our ports of entry, but also research into combating imported pests that have already arrived. Our leaders must understand that not all alien threats to our nation come from terrorists. Good point!-What do you think is the best way of going about destroying invasive plants? The best way is to pull them up. In the case of a thorny bush like Japanese Barberry, that's not easy, and cutting the plant at the ground is best. With some invasives, like Japanese Knotweed, herbicides like Round Up Brush may be needed for major infestations. It's important that the plants should be pulled or cut before they go to seed so they don't leave a new generation to contend with.